@imVkohli has spoken about Delhi's pollution in the past, why didn't it matter on Sunday? Should Delhi be allowed to host sporting events anymore? On Sunday morning, a masked Sri Lanka team took the field on Day 2 in the third test match against India. With Virat Kohli edging towards what everyone hoped would be his maiden triple century, the Sri Lankan team stopped play for over a quarter of an hour because of the air quality. For probably the very first time in the history of the game, pollution caused stoppage of play. If it was a move to stop the flow of runs and break India’s attention, it worked, as Lanka managed to get the wicket of Ravichandran Ashwin immediately after. Virat Kohli fell soon after, much to the dismay of the fans. However, this did not stop the visiting team from creating an interruption every five minutes, eventually forcing a visibly annoyed Kohli to declare the innings. His team would bowl if the Lankans couldn’t. 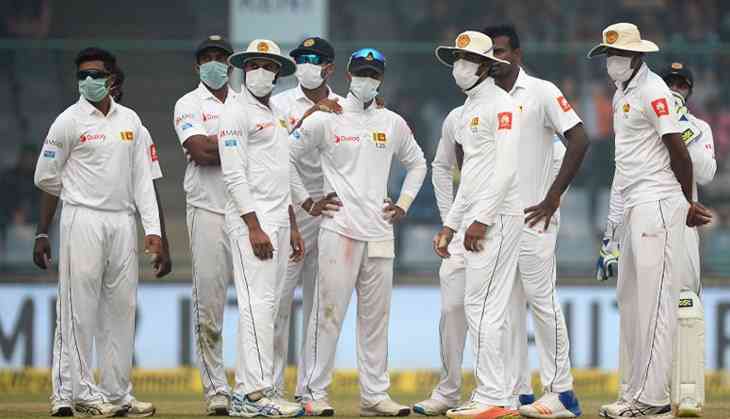 While the move was inadvisable (at best), people actually started to laud the fact that the Indian team did not wear masks in toxic outdoor conditions as “a statement of intent”? Something similar was heard from the commentary box as well. None of the Indian players are wearing a mask. Good statement by the team. SL players tom will wear rain coat because they are sweating ! Let’s be clear, Virat and his boys coming out to play cricket in Delhi is as bold a statement as Sauron and his orcs continuing with their usual routine in Mordor. In fact, the general quality of air in both places is probably the same in both places. "Air quality remained " Very Poor " in Delhi. Prominent pollutants PM 2.5 and PM 10 levels remained above the normal standards at most of the locations in the city. Say Sri Lanka did this just because they knew no other way to stop the very capable Indian captain at the crease. Say, these “shenanigans” or “this Oscar-worthy performance” was indeed to submit India into declaring the innings. Is there any doubt in anyone's mind that their “excuse” was indeed valid? While Kohli, no doubt out of responsibility to both board and country, ignored the hazardous air condition, Delhi's air pollution is an issue he has already spoken about in the recent past. On 15 November, Virat Kohli took to Twitter urging Delhiites to take share cabs, even tagging Ola as coolly as he bats. On Sunday, Delhi boy Kohli actually had a chance to make a difference and get the attention of the apathetic government, which has often been lax in enforcing pollution control laws for fear of alienating important voting blocs. However, by agreeing to let his team play unprotected in unfit conditions, Kohli, as he so rarely does on the field, missed a golden opportunity. Granted, as an athlete, it is not Kohli’s job to change the country, or even his home city. His introduction might be getting as long as Daenerys Targaryen (Read: 'batsman', 'Indian cricket team captain', 'breaker of world records') but it doesn’t include 'social servant' yet. However, Kohli is the captain of the Indian cricket team and is therefore one of the most significant public figures in the country. With that being the case, it isn’t extraordinary to expect something off the pitch from him as well, especially when he is going on the record , even if only in his personal capacity, to create awareness about the situation in Delhi. When politicians and masses fail, you expect some influential public figure to rise to the occasion and show some smartness and empathy. India, likewise, needs people who will waste their precious minutes on a big platform, so that the public can realise that sometimes, it is bigger than us, bigger than a cricket game. Ultimately, though, the responsibility for ensuring the safety of players and spectators falls at the doorstep of the BCCI. While Kohli may be able to influence the cricket-watching public, the BCCI disallowing matches in Delhi would have potentially forced action from the lackadaisical State and Central governments. In fact, this was the stance taken by the FIFA U-17 World Cup India 2017, when it was decided that Delhi would not host any matches after Diwali. While the standard reaction to the move was that FIFA was making a bigger deal of the Delhi pollution than the necessary, the post-Diwali situation vindicated the Local Organising Committee and FIFA’s decision to not host any games at the Jawaharlal Nehru Stadium beyond 16 October. However, despite such high-profile precedent, air pollution is still a non-issue for the money-hungry BCCI. The fact that the BCCI decided to hold a test match in New Delhi, despite knowing all too well the apocalyptic conditions that prevail around this time of the year, is telling of the organisation's priorities. With cricket being more than just a sport to the Indian public, it's about time that the board that controls the sport also starts paying attention to public interest. Sadly, that doesn't seem likely anytime soon. With this attitude, it could also be argued that Kohli is potentially the only person capable of shaking the BCCI out of its slumber. Sadly, love him though we may, it can’t be ignored that a powerful man in Indian and world cricket, an influential public figure, and a 29-year-old man who grew up in Delhi, had the chance to make a difference on Sunday. And unlike the times he's on the pitch with his bat, he failed. TWEET THIS @imVkohli has spoken about Delhi's pollution in the past, why didn't it matter on Sunday? Should Delhi be allowed to host sporting events anymore?